Dodrupchen Jikmé Tenpé Nyima (Tib. རྡོ་གྲུབ་ཆེན་འཇིགས་མེད་བསྟན་པའི་ཉི་མ་, Wyl. rdo grub chen 'jigs med bstan pa'i nyi ma), the Third Dodrupchen Rinpoche (1865-1926) — one of the most outstanding Tibetan masters of his time and the teacher of many great lamas, including Jamyang Khyentsé Chökyi Lodrö. He is held in the highest esteem by His Holiness the Dalai Lama, who calls him “a great scholar and a remarkable yogi”. The writings of the Third Dodrupchen are one of the main sources used by His Holiness in his personal studies of Dzogchen, and he quotes him frequently in his teachings. 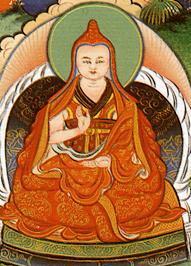 Jikmé Tenpé Nyima was born in East Tibet as the son of Dudjom Lingpa. He was recognized by the fourth Dzogchen Rinpoche, Mingyur Namkhé Dorje, and others, as the incarnation of the previous Dodrupchen Jikmé Puntsok Jungné and was enthroned at Dodrupchen Monastery, where he remained for the rest of his life. He received many teachings from Patrul Rinpoche, and also Jamyang Khyentse Wangpo, Mingyur Namkhé Dorje, Dzogchen Khenpo Pema Vajra, Mipham Rinpoche and Jamgön Kongtrul, and he became extremely learned in both New and Old Tantras. He built up the Dodrupchen Monastery, to the extent that it became a renowned centre for study and practice. He gave teachings for many years, after which because of ill-health he lived in seclusion at a hermitage called Gephel Ritrö. Among his students was the great Jamyang Khyentse Chökyi Lodrö, who came twice for several months to receive teachings from him. He is known for the scholarly treatises he wrote on many subjects, for example his famous "Outline Commentary on the Guhyagarbha Tantra". The Thirteenth Dalai Lama said of him "a writer of his quality is very rare in this age", and HH the fourteenth Dalai Lama, who often quotes him and praises him as having written amongst the greatest scholarly works on the Nyingma teaching, calls him "a very special being... an amazing Lama free from bias concerning the views of Nyingma, Sakya, Kagyu and Geluk". From the Dzogchen Section (Tib. རྫོགས་ཆེན་སྐོར་, Wyl. rdzogs chen skor), an essay on the Ground and the appearances of the Ground, used by His Holiness the Dalai Lama for his teachings on Dzogchen, in San Jose, 1989. Partially translated in Dzogchen, by His Holiness the Dalai Lama. This page was last edited on 8 May 2014, at 15:23.